Boyer Candy Smoothie Cups are now available in fun bite size in a 60-count changemaker display making its way to a cash register near you. 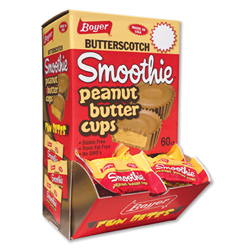 The Smoothie Cup, a unique combo of creamy butterscotch cup with a peanut butter center, has been delighting customers since the Boyer Brothers created it in the 1940s. Now this creamy concoction is available in fun bite size in a 60-count changemaker display making its way to a cash register near you. Smoothie Cups, like Mallo Cups, are gluten free, kosher, trans fat free, and contain no GMOs. “We are delighted to provide our customers with a continuation of quality chocolates for over 90 years,” quoted Deborah Forgione, Director of Marketing for Boyer. Smoothie changemakers are packed eight displays per case and will be available for delivery mid-July 2016. Boyer, as always, is proud to make all of its candy in the USA, a statement that is in the forefront of the 2016 Presidential election. For more information and high resolution jpegs, contact Jenna Fiore.